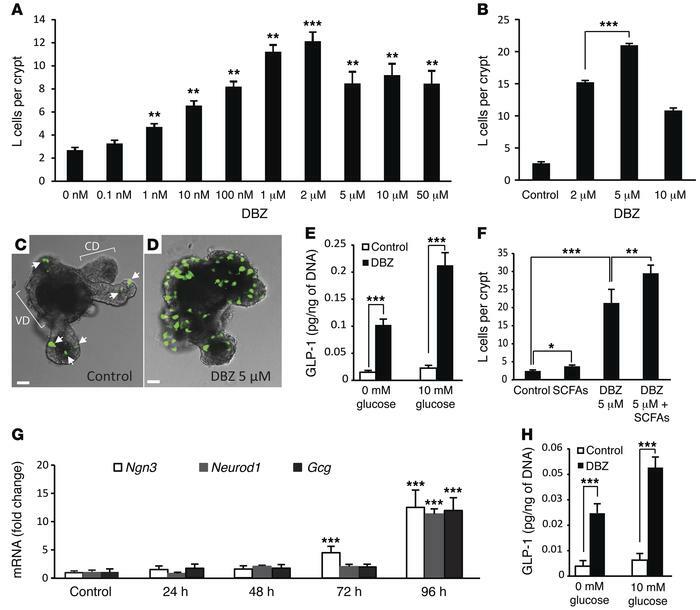 L cell enrichment in intestinal organoids by the NOTCH inhibitor DBZ. (A) L cell numbers in mouse ileum organoids after 96 hours of continuous exposure to different DBZ concentrations. (B) L cell numbers in mouse organoids 96 hours after a 3-hour DBZ pulse. (C and D) L cells (green) in a representative Glu-Venus mouse organoid before (C) and 96 hours after (D) a 3-hour pulse of 5 μM DBZ. Shown are maximum projections of a z stack through the organoid. VD, villus domain, CD, crypt domain. Arrows denote L cells. Scale bars: 20 μm. (A–D) n = 100 crypts (3 platings) per series. (E) Baseline and glucose-stimulated GLP-1 secretion in mouse ileum organoids 96 hours after a 3-hour pulse of 5 μM DBZ. n = 7 per series from 2 platings. (F) L cell numbers 96 hours after continuous treatment with SCFAs (combined 5 mM acetate, 1 mM propionate, and 1 mM butyrate), 5-μM DBZ pulse, or both. n = 100 crypts (3 platings) per series. (G) Gene expression of Ngn3, Neurod1, and Gcg in organoids at the indicated time points after a 5-μM DBZ pulse. n = 4–6 samples from 3 platings. (H) Baseline and glucose-stimulated GLP-1 secretion in human ileum organoids 96 hours after a 3-hour pulse of 5 μM DBZ. n = 6 per series from 2 platings. *P < 0.05, **P < 0.01, ***P < 0.001 vs. control or as indicated by brackets, 1-way ANOVA with Bonferroni test (A–D and F) or nonpaired 2-tailed Student’s t test (E, G, and H).